Reserve Bank Governor Glenn Stevens says Australia needs to earn more and spend less. I can't help noticing that either earning more or spending less would be enough to increase saving, which seems to be the aim. But if we really must earn more and spend less, the surest approach is to replace income tax with a consumption tax. Income tax punishes earning and exempts spending. A consumption tax does the opposite. Income tax, by raising export prices but not import prices at the border, encourages trade deficits and hinders efforts to trade out of debt (Ireland take note). A consumption tax does the opposite. For good measure, the compliance cost of a consumption tax is far lower (zero for the purpose of hiring employees). The standard objection to replacing income tax with a consumption tax is that it would raise prices, causing a regressive redistribution of purchasing power and a devaluation of past savings. If prices and net wages stay the same, so does purchasing power. In the diagrams, “costs” are not exhaustive, but include only what is relevant to the comparison. Accordingly, “income tax” includes tax on current income from labour or capital, but excludes Capital Gains Tax and Resource Rent Taxes. CGT and RRTs target economic rent, i.e. the surplus (over and above the necessary components of price) accruing to owners of non-replicable assets. Economic rent can be tapped for public revenue without raising prices or inhibiting production or exportation. Because “personal” income tax is actually remitted by employers, maintaining the same net wages for existing appointments is easy: it's the “do nothing” option. New appointments can be subject to a new IR regime, preferably with a lump-sum per-shift bonus as an implicit loading for part-timers and casuals. If Australia abolishes income tax (excluding CGT and RRTs), won't global corporations shift capital to Australia? Yes, but that's to Australia's advantage. Won't they also find artificial ways to shift profits to their Australian subsidiaries? Yes, but the extra profits can be captured by a “resource-rent” tax (if it's implemented as a general tax on corporate super-profits) and by CGT on shares in the local subsidiary (if it's separately listed). So profit-shifting is another reason to retain CGT and RRTs. But if the coming tax summit doesn't lead to the abolition of all other components of the present income tax system, it will be a charade. P.S. 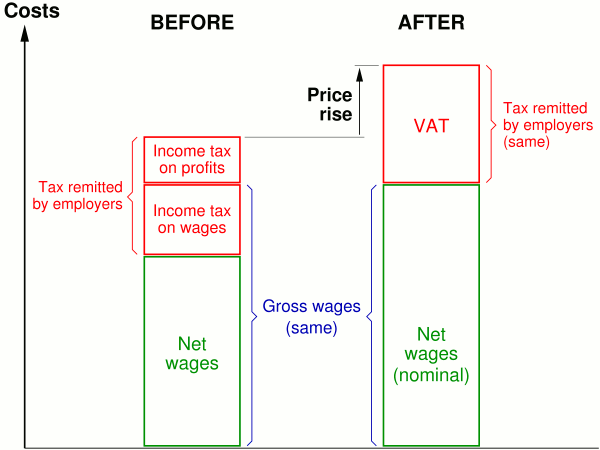 (Mar.17, 2011): The above argument assumes that the consumption tax takes the form of a VAT. 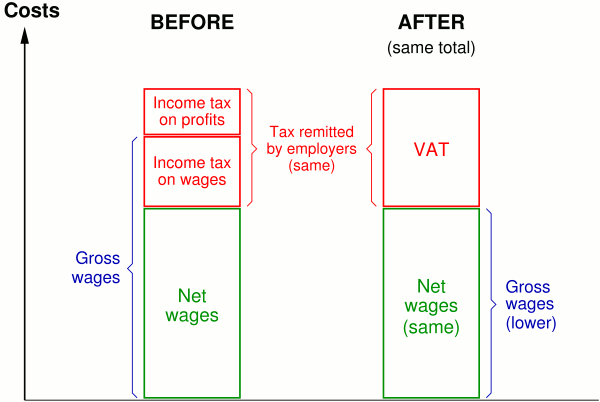 Replacing the VAT with a retail tax would reduce prices because the total tax remitted would stay the same (although it would be remitted at the last step before the consumer, rather than from multiple points along the way) while compliance costs would be reduced.